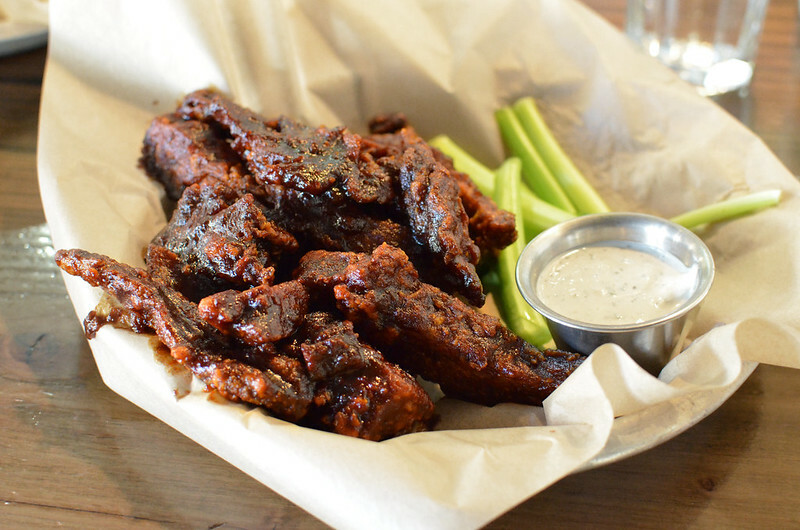 The motto for the city of Denver should be: Come to Denver for our Seitan Wings! Vegan wings—be them seitan, mock chicken or cauliflower—have come a long long way these past few years. Through those years I’ve made the pleasant effort to consume as many as possible. I’m thrilled to say that the Seitan Wings ($10 / $5 Happy Hour) at City, O City are THE BEST I’ve ever had up to this point. A heaping slab—I’d say at least a pound—of chewy house-made setian is sliced and fried in a crisp batter creating ‘wings’ with a gristly interior and crackling-like exterior. The texture even holds true after a night in the fridge… yes, they are still crispy the next day. They come slathered in a choice of BBQ or Buffalo Sauce. While I normally order buffalo anything, on this occasion I gave in to my BF’s pleas for BBQ after nearly burned his face off with Buffalo Tigers at Vertical Diner. He was a fan of the sauce. I found the BBQ overly sweet and less smokey than I prefer, but there is nothing inherently wrong with that. No matter what I thought of the sauce, it could not mask the perfect execution of these seitan wings. The service at City, O City feels slow. But sitting at the kitchen bar we could see the action never let up. Pans were flash flying, tickets were printing and the mellow dude at the salad/waffle station never broke a beat. Watching him jump back and forth between stainless steel bowls and waffle iron, it was hard to choose which station I wanted him to jump on for me. I almost ordered the Chilled Rice Noodle Salad (seen being made here) except that day’s special waffle had my name all over it: Yes, my name is Nacho Waffle ($12)! This is part of the W.O.W series, an ever changing delight of unexpected Waffle Of the Week. 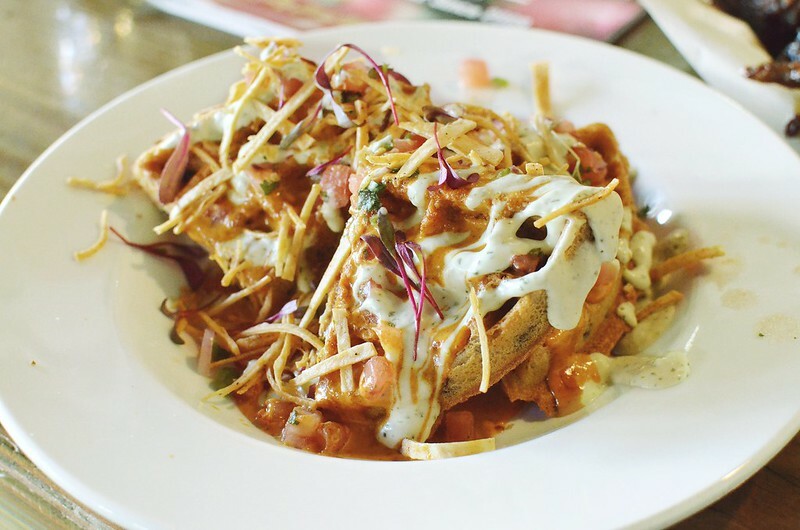 The gluten free Black Bean Waffle comes topped with Vegan Cheese Sauce, Pico de Gallo, Chili Tortilla Strips and Coconut Cilantro Sour Cream. Conceptually, I loved it. Consuming it, I found myself wishing for a contracting texture—such as jalapenos, olives or radishes—to cut through the similar sour cream and cheese sauces. The Kimchi and “Sausage” Torta ($12 / $5 Happy Hour) sounded amazing: Fig/apricot/barley patty with pickle relish, mayo and house-made kimchi. What I got was a un-fruity black patty, finely chopped mild pickles and a generic sandwich roll saturated with too much mayo. Although we arrive around 2pm on a weekday, presumably after the lunch rush, City, O City was packed. This also put us into Happy Hour (2pm-6pm and 11pm-close, 7 Days a week) where popular items are only $5 for full sized portions. But all hours at City, O City appear to be happy. 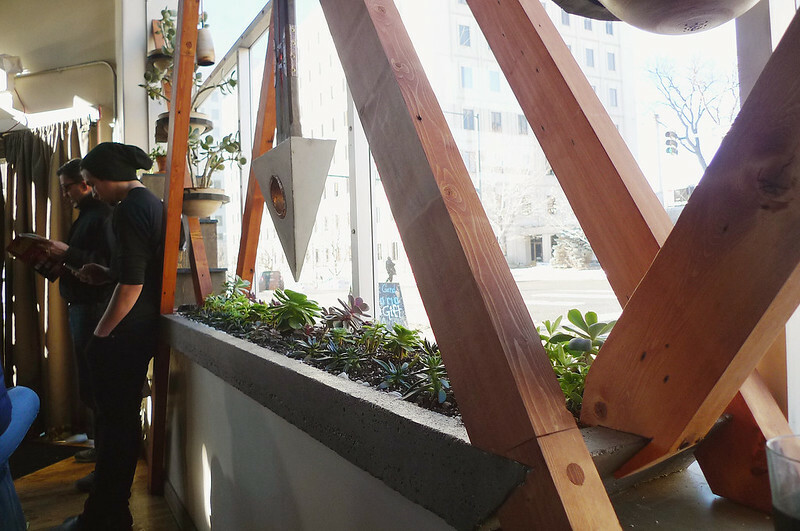 We chilled by to this nifty window planter for 20 minutes waiting of a table—any wait for those Seitan Wings is happy indeed. 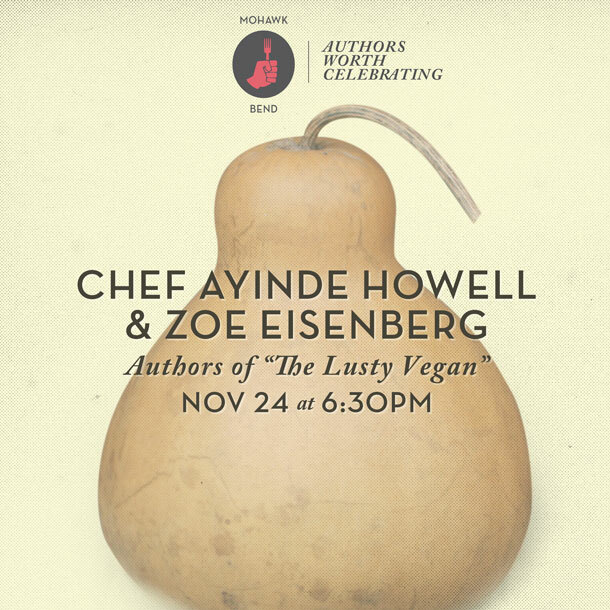 Monday, November 24 @ 6:30 p.m. This summer I won a $200 gift card from Veggie Grill in their Taste the Sunshine Instagram contest. While my first instinct was to stuff my face with $200 worth of Crispy Cauliflower, I reluctantly let that dream go and instead committed myself to eat everything on the Veggie Grill menu! Two months later, I’ve burned through the gift card and have just a handful of items to go. This week I closed out my first category: Sandwiches. 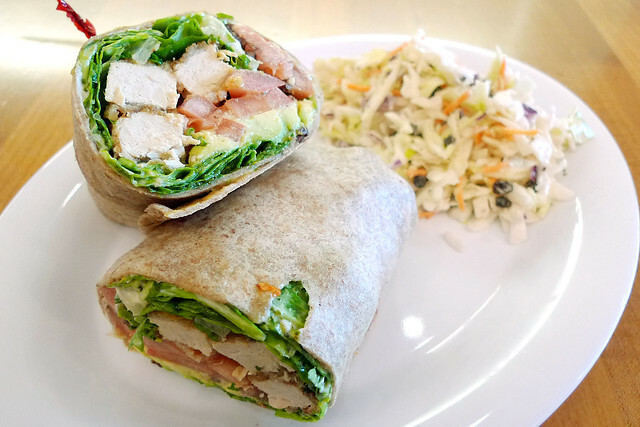 Part of the beauty of my Eat the Veggie Grill Menu Challenge is dropping my assumptions about dishes I haven’t tried… Like the Grillin’ Chickn’ Sandwich. I always figured it’s the same as the Santa Fe Crispy Chickn’ but without breading… and why would I want it without breading?! But, as it turns out, the “Blackened” Chickn’ is actually *more* flavorful than the crispy. In fact, this maybe a new favorite. 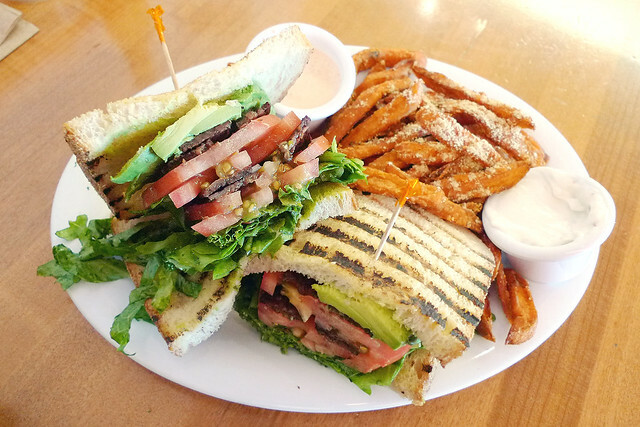 During the Eat the Veggie Grill Menu Challenge I finally tried the universally loathed B.L.T.A.! Every Instagram post I’ve seen on this sandwich has given it a big fat thumbs down. Having now tried it, I’m unclear on where the yuck-factor comes from. I did order it with the garlic aioli on the side because I’m not a fan of aioli on anything. Otherwise, I’d say this a perfectly good sandwich that I probably would order again… in fact, I did! 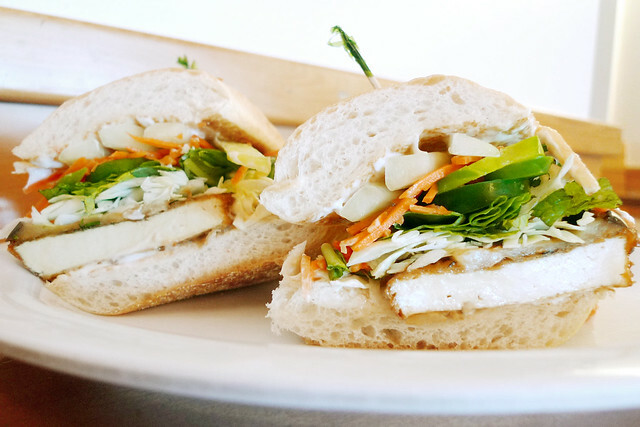 Recently, new fall items arrived at Veggie Grill, like this awful Glazed Tofu Banh Mi! The tofu and herbs are fine, but it tastes like it’s served on a Generic Supermarket Brand hot dog bun… Ugh, maybe it’s better as a wrap. Update: It is not. VG-Cheeseburger ($9.95) Topped with VG-Cheese, pickles, lettuce, tomato, red onion, chipotle ranch. El Dorado Style upon request with jalapeños and caramelized onions. Inside and out of food challenges, my go-to comfort item at Veggie Grill is The VG Cheeseburger Eldorado Style with tempeh bacon. It tastes like a Gardein/ Daiya mashup… completely fake, majorly messy. I’m sure it is terrible for me but I love it. I use to LOVE the Buffalo Bomber at Veggie Grill… but then I discovered the B-Wing Salad and have never gone back. 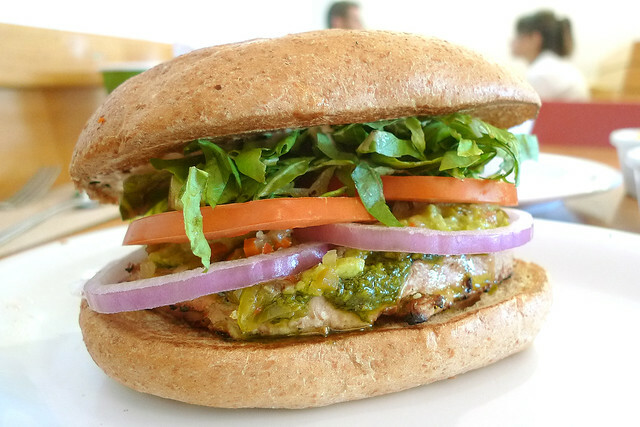 After revisiting this sandwich during the Eat the Veggie Grill Menu Challenge I still feel the same. For you see, I adore buffalo sauce and by slicing the fried chickn’ leads to an exponentially higher amount of buffalo soaked surface, hence more buffalo flavor. Plus the bun muddles the buffalo sauce further. So, in conclusion, the B-Wing Salad is better than the Buffalo Bomber because of math. 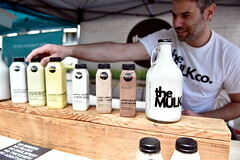 Not to be missed is the Bali Bliss BUFFALO STYLE. This sandwich is massive! I wouldn’t recommend getting the additional avocado. 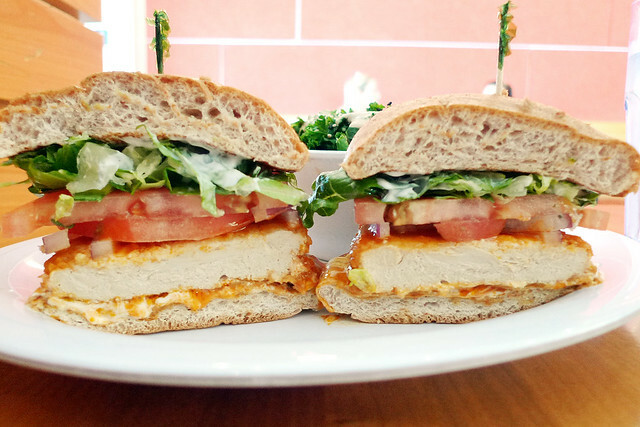 It make the sandwich too ‘creamy’ since it already has an ample amount of ranch dressing. 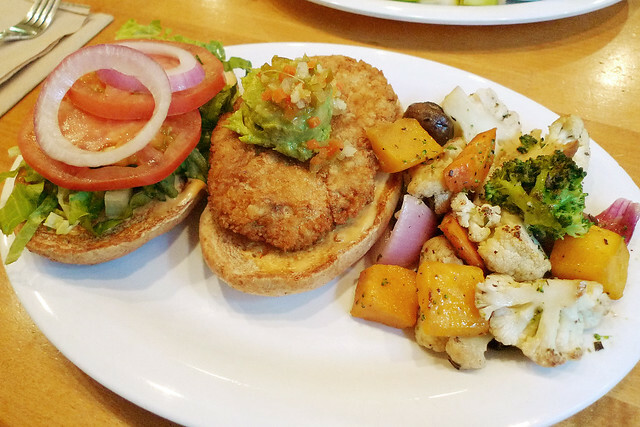 On the last day of the Eat the Veggie Grill Menu Challenge: Sandwiches, I tackled the two I dreaded–the most horrifying of which is the “Crab” Cake. 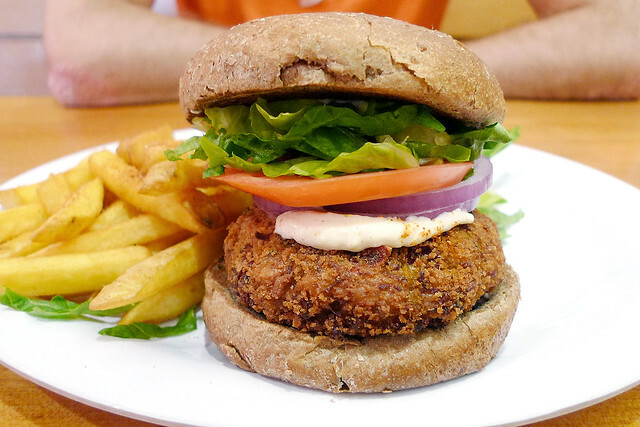 The thick breaded patty is loaded with lumpy hunks of fish-like protein that mimics the real thing far too closely for this seafood loathing girl. The sweet relish of tarter sauce helps cut the ocean of flavor bellowing forth with every bite–but not enough, no, not enough for me. The flavors of the sea linger on my tongue, mocking me as my face crumples into a sour cringe and I push this dish into the arms of my gleefully awaiting BF. He devours it with innocent gusto. To those who enjoy the taste of seafood, per haps you will enjoy this dish; but to though whose bodies involuntary retreat at the mention of fish, this dish is far too “real” for us. 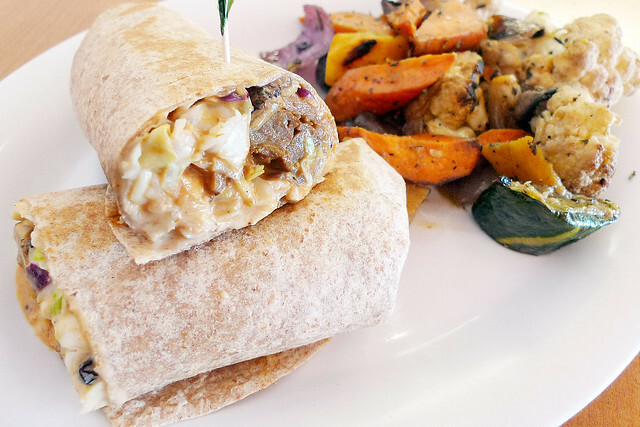 There are lot of people–vegan and omni–who rag on Veggie Grill for focusing “too much” on imitating meat. My junk food heart completely disagrees. 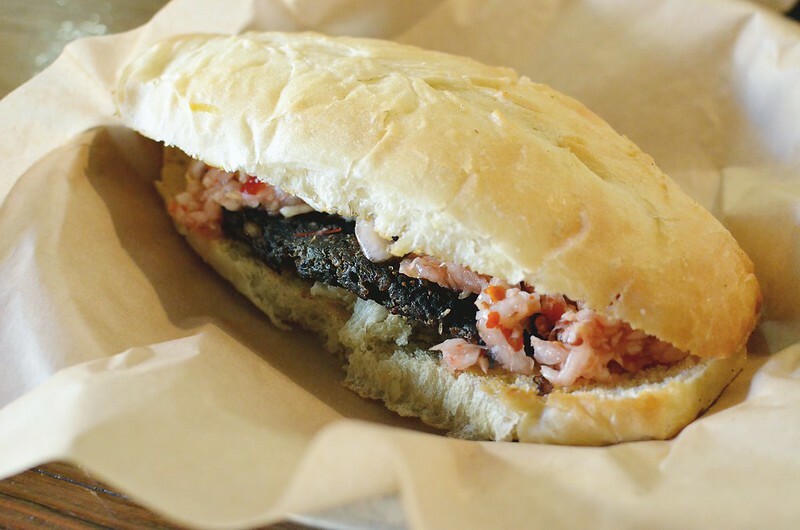 But for these folks interested in wholer-foods, the disgusting Papa’s Portobello is for them. 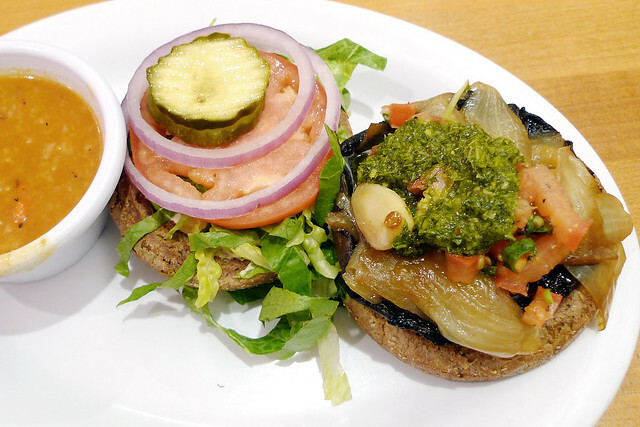 The supple slab of charred portobello is loaded with chopped tomato, basil, roasted garlic, caramelized onions, cilantro pesto, lettuce, red onion and chipotle ranch. Much like seafood, I cannot even pretend to tolerate slippery mushrooms attempting to pass as burgers and this one packs way too much for me. I *know* I’m in the minority on ‘shrooms, but I also know there are others out there who deliver the long eye roll when a grilled portobello is the only veg option. 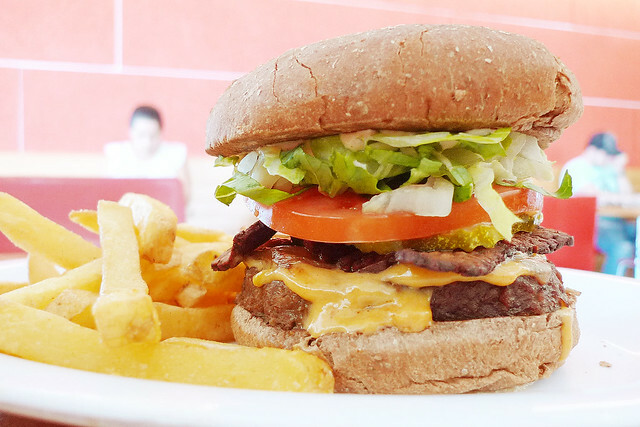 For those like me, your mind will not be changed by this burger. For the other 70% of you who dig putting fungus in your mouth, enjoy. Bonus Sandwich! 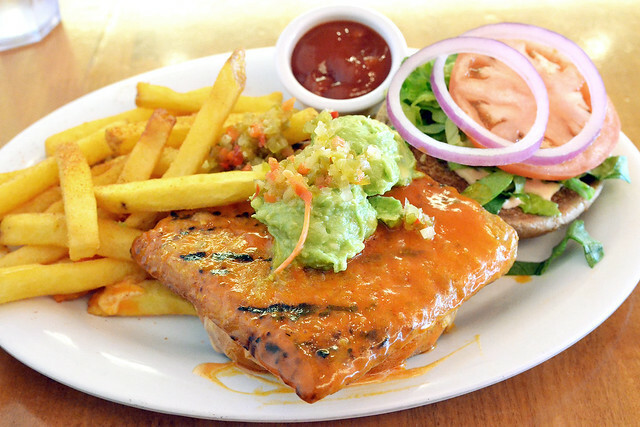 So, in the middle of this challenge, Veggie Grill transitioned to a new menu and dropped the BBQ Steak sandwich. Can’t say I’m surprised. Stuffed with strips of veggie-steak in tangy barbeque sauce, caramelized onions, chipotle ranch and coleslaw, this heavy, condiment soaked sandwich (I got it as a wrap) is not what appeals to me today. But it was the sort of dish I gravitated towards in the past. The BBQ Steak one of the very first things I tried at Veggie Grill when I moved to LA–and I totally hated it for all the same reasons I hate it today. I think it is way too saucy but I know a lot of people love this crap. I rue the day I assumed SunCafé was a commonplace sandwich/salad/smoothie joint. It is so, so, so much more. 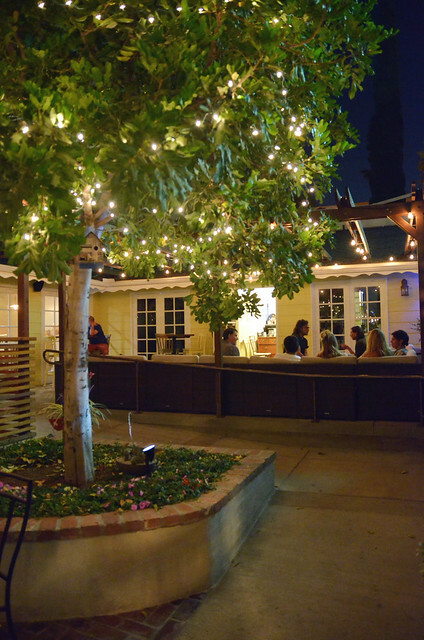 The converted 1920’s ranch home (formally Zach’s Café) on Ventura Blvd extrudes warmth and comfort while the menu promotes whole food in comforting and familiar forms. 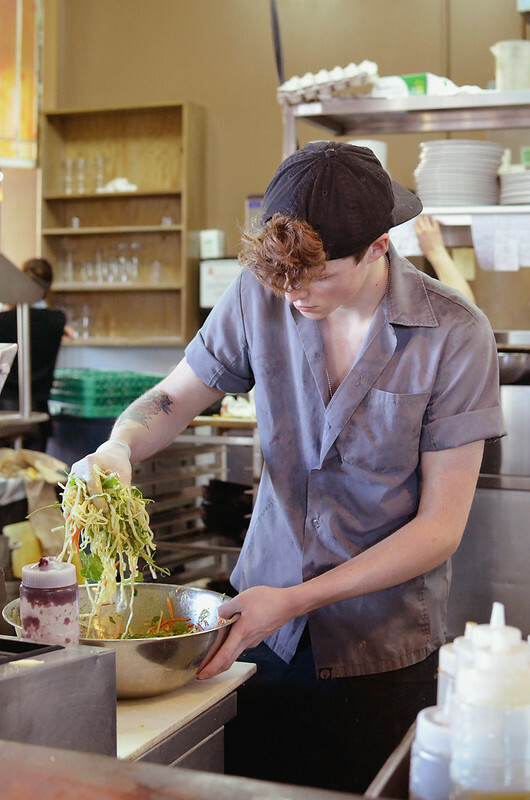 Chef Roy Elam—who shreds guitars along with carrots—heads the inventive menu of colossus salads, raw burgers, golden beet linguini and Reuben themed pizzas… but we had no room for those because we—Elana, Hanna, Alice and I—filled up just about everything else. 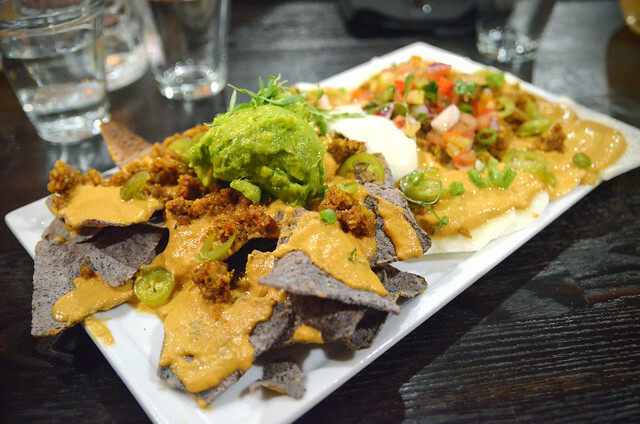 Sun Nachos—one of the most popular menu items—were the obvious starter. While debating whether to get the dish with baked blue corn chips or with raw thin-sliced jicama chips, the waitress chimed in “You can do a split order.” So that’s exactly what we did. Topped with “SunChorizo,” nacho cheese, guacamole, pico de gallo, jalapeño, green onion and cashew sour cream this concoction makes the best vegan nachos I’ve had to date. 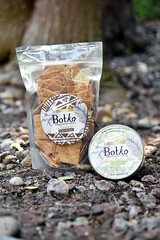 Half of us loved the corn chips, the other half loved the jicama, so a split order is the perfect way to go! Me? I preferred the chips. The Caesar Salad was not what we expected. 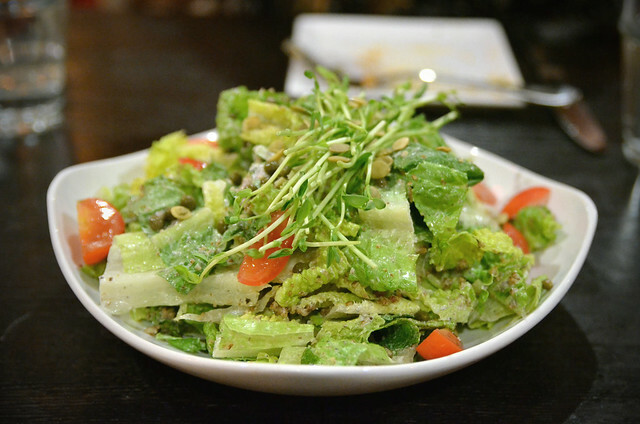 Crisp leaves of romaine lettuce and quartered cherry tomatoes are tossed in raw Caesar dressing with capers then lightly coated in garlic pecan crumble. Apparently there was also raw croutons in here… do you see them? I don’t. We asked the waitress and she swore they crushed up in there. Still, the subtly dressed salad refreshed the pallet; although I may eat my way through the rest of the salad menu before coming back around to the Ceasar. 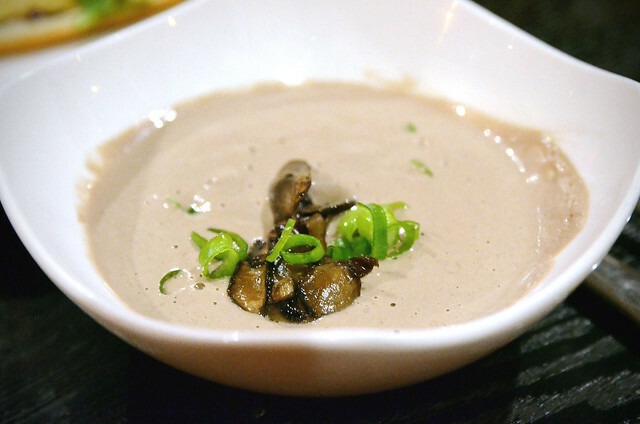 Raw Cream of Mushroom Soup… I didn’t care for this one. 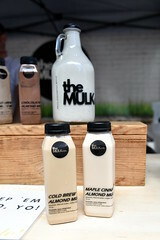 The taste is subtle and refined, but the thick and frothy texture is not for me. I had nearly given up on all vegan mac & cheese. 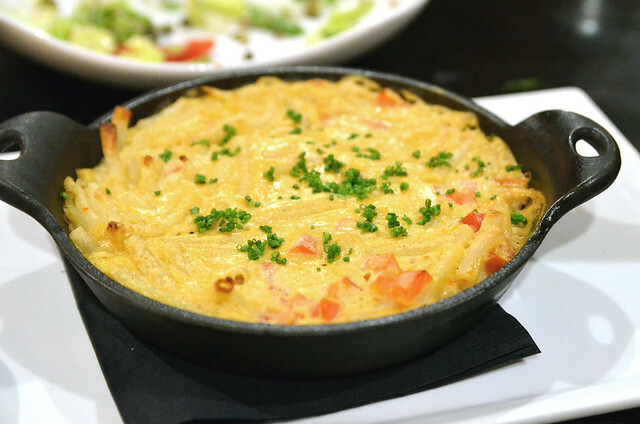 From the ashes of the sloppy glue or watery plastic of most vegan versions rises the glory of SunCafé’s Mac & Cheese—and it’s gluten free to boot! Slender tubes of quinoa pasta are tossed with tiny diced tomatoes and then broiled in the smoothest-richest-most-perfect-ever cashew cheese sauce. Browned tips of pasta periscope up from the bubbling bath as chewy charred bits stick to the sides was we scrape it from the cast iron dish. The Farmer’s Market Pizza was an unexpected pleasure. While the gluten free rice flour crust is mearly passable, the toppings sing. 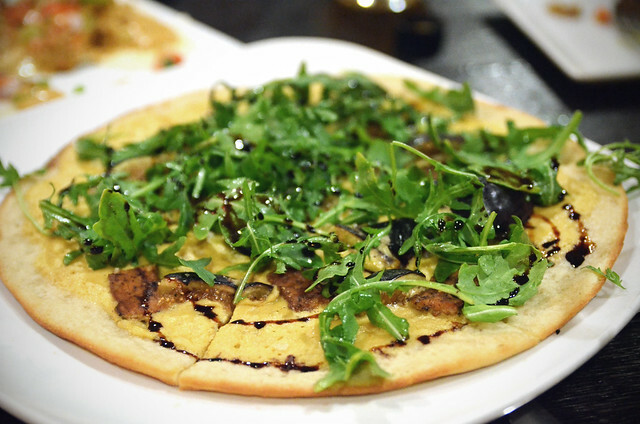 Market fresh figs sit atop white sauce (a blend of cashews, garlic, shallots, and nutritional yeast), with smokey tempeh bacon, peppery arugula, meyer lemon vin and drizzled with a balsamic reduction. Owner Ron Russell approached our table as we debated who got the last slice. A tall (or so I think… we were sitting down) man with a beaming smile who accepted our raving compliments on the pizza but deflected them into the kitchen. “The kitchen suggested this combination… I wasn’t too sure about it. I mean figs? On a pizza…?” We all laughed. This moment of commodity distracted everyone as I stole the last slice. I would have been happy to end the meal here, but most people love dessert. My friends are no exception. The loose, mouth-coating texture of cheesecake is one of my least favorite desserts ever; but cheesecake is the star of the menu here. I quickly learned why. 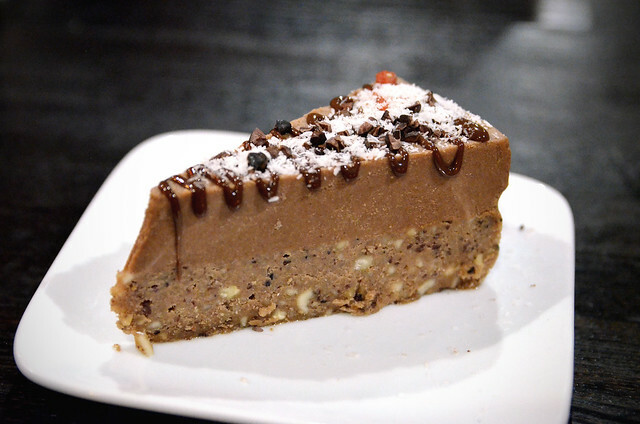 The Cookie Dough Cheesecake is firm and dense—perfect for me—not too sweet and plenty for four hungry girls. 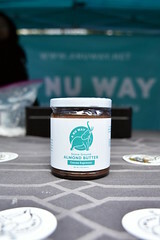 The base is a mixture of cashews, coconut oil, and cacao nibs with other stuff (I’m not sure what) on top. It made a fan out of me; I still haven’t shut up about loving this cheesecake! An impromptu weekday lunch with my mom finally brought me to Goldie’s. The living wall beckoned us from the street but offer little shade for a midday meal. Fortunately, the interior proved to be lovely. Designed by the restaurateur Nick Mathers, it’s been described as Frank Lloyd Wright-meets-lumberyard which doesn’t make any sense to me at all. 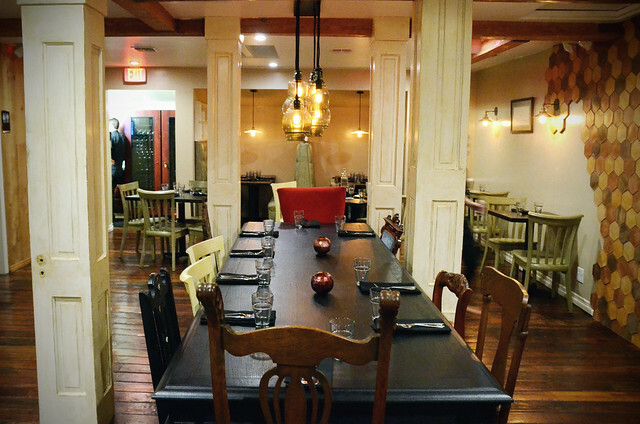 This is clearly a mid-century derived design accented with Moroccan tiles and knock-off Wegner Elbow chairs. The smoky kitchen air wafted through the elegantly slit wall directly into the dining room. We figured if we are going to breathe all this smoke we might as well start off with the Grilled Flatbread ($8). 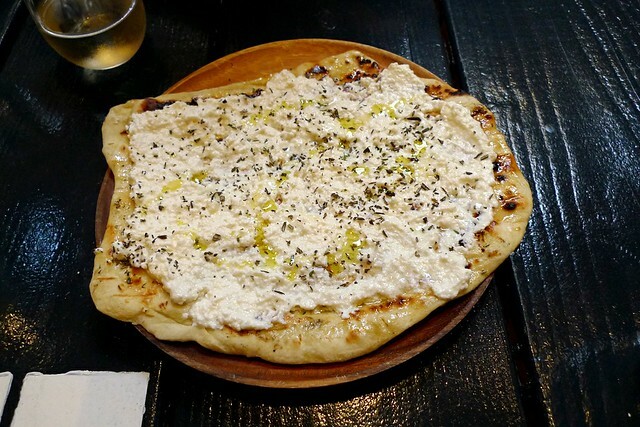 Slathered with honey, rosemary and ricotta, the flatbread arrived unsliced on a wooden platter. With butter knives we dully sawed into the tough bread—neither crisp nor chewy—leaving deep groves in the gorgeously finished wooden plate. The ricotta was flavorless, topped with such a scant amount of rosemary and honey that the kitchen may as well have left it off. Flatbreads are no longer on the menu. I understand why. The Kale Salad ($12) was a much better event. 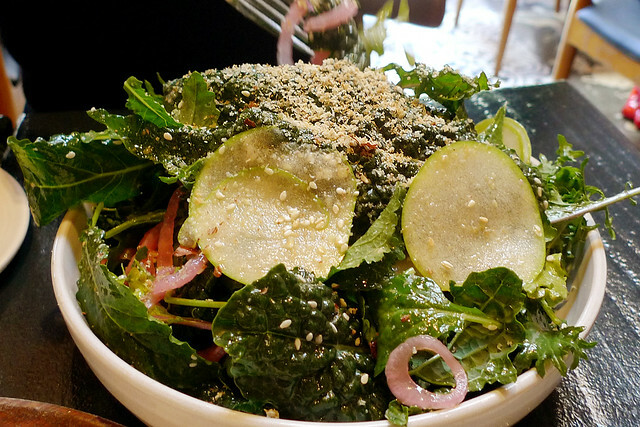 Tender leaves of mixed-age kale tossed in honey dressing with thin slices of granny smith apple and finished with toasted sesame and blushing pink pickled onions. Large and filling, this salad was woefully overdressed. It was so unfortunate considering the how well all the other elements worked together. I definitely would order this again, but with half the dressing. The Grilled Baby Leeks ($14) were another head-scratcher. The slender stocks of what looked more like scallions then baby leeks (we asked the waitress and she said they were scallions) were almost impossible to cut through. The pungent puddle taleggio fonduta balanced out the acidity of the pickled seeds. 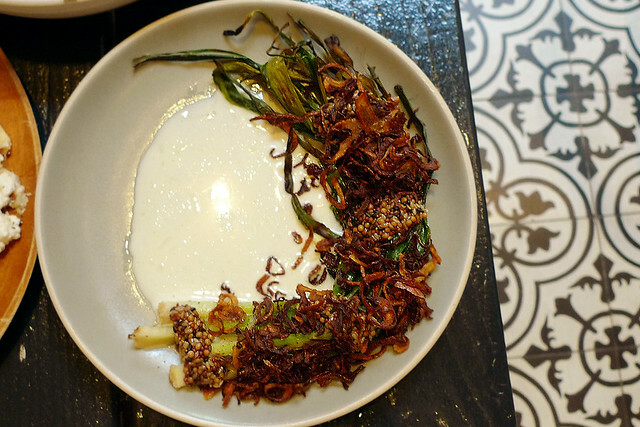 Finished off with a tangle of crispy onions, I found the onions more palatable then the tough leeks. 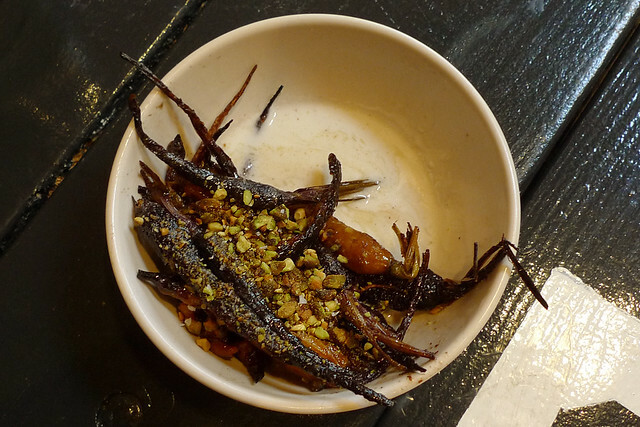 Finally, the Roasted Carrots ($12) arrived. The charred exteriors, filled with tender sweet flesh, are cooked perfectly. The buttermilk bath envelopes the crunch of the spiced pistachio. This was a phenomenal dish. Too bad the rest of the meal couldn’t match its quality. “That’s not the same thing at all” he stated dryly. Ouch. Well, for reasons besides my eating inclinations, I didn’t get the job. But I did get jolted into thinking about the stark differences between vegetarians and vegans. I guess I always believed we were part of the same team—and we are teammates in a lot of ways! But as I attempt to delve deeper into the vegan lifestyle I’ve discovered difficulties with something I’ve always taken for granted: Breakfast. 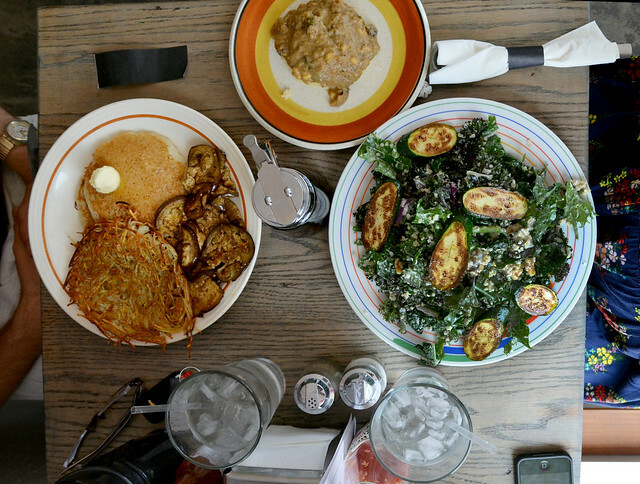 For vegetarians, breakfast/brunch is a smorgasbord of benedict, pancakes, waffles, quiches, parfaits… and so on. It’s a egg and dairy farmer’s delight. But I’ve quickly learned that finding vegan friendly breakfasts, especially on a road trip, is shockingly difficult. Before heading to Phoenix, I was sooo thankful to stumble upon Bragg’s Factory Diner on Instagram! As an architecture nut, the Frank Lloyd Bite ($10) beckoned me. 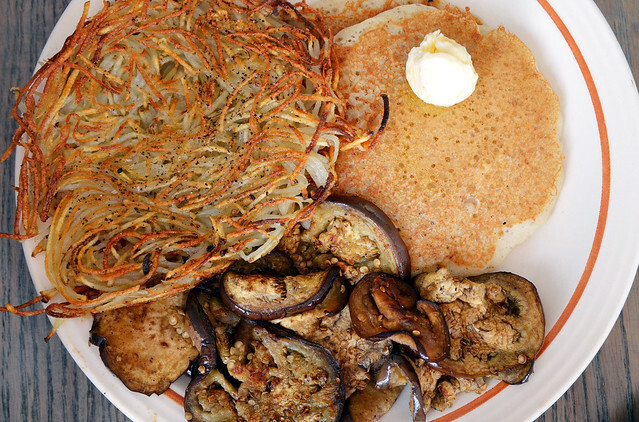 It comes with 2 pancakes, hash browns, eggplant bacon and a biscuit smothered in gravy.The pancakes were stunning—the real vegan at the table gleefully devoured them. They are thin, with a crisp buttery shell, reminiscent of everything wonderful about the McDonald’s breakfast menu. The hash browns, a fried tangle of noodle-like potato threads, is light in texture and taste. A heavy pour of hot sauce quickly remedied the situation. The eggplant “bacon” was the riskiest element on the plate. As is visually obviously, it is not attempting to mimic pork. The soft slabs of smoky eggplant offer a bacony flavor, but none of the pungent fat or chewy texture. I found them quite addicting. Overall, the deliciousness of the Frank Lloyd Bite was marred only by it’s monochromatic appearance. 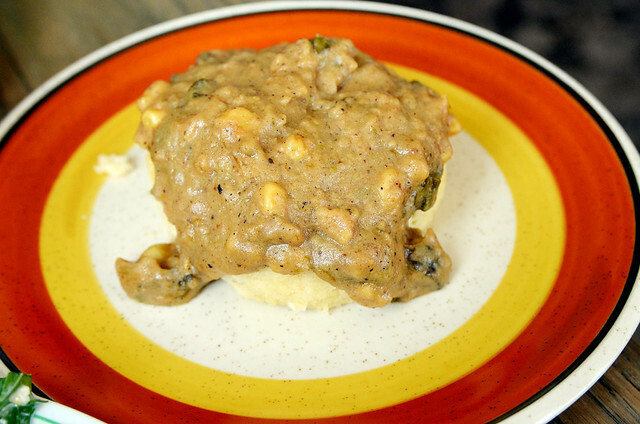 I found the biscuit, drenched in mushroom and corn gravy, too gummy for my tastes. But considering how rare it is to find vegan biscuits and gravy, I must applaud the effort. To balance out the beige, we ordered the King Kale Salad ($8). Topped with medallions of grilled zucchini and a sprinkling of quinoa and walnuts, it’s all tossed in a creamy lemon dressing. I found the size of the kale leaves difficult to eat, so I attacked it with fork and knife. 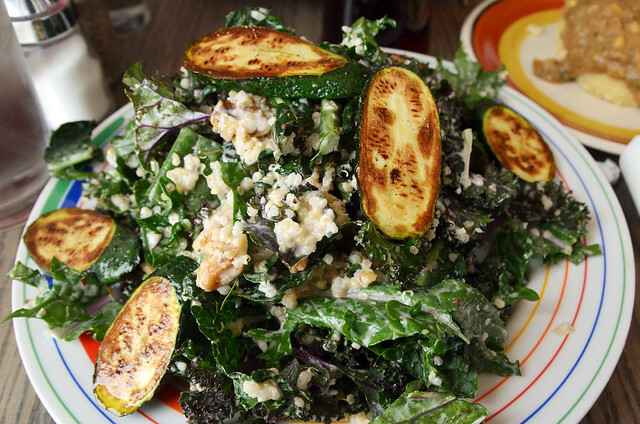 It seems silly and simple, but the barely dressed grilled zucchini slices were the best part of this salad. It’s a lot of roughage to eat, but all that kale was the perfect counterbalance to the carb-fest of potatoes and pancakes! Overall, the food is neither groundbreaking or outstanding. 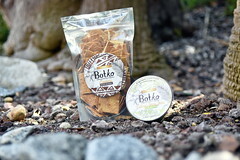 It’s well executed, explorative and made with heart. 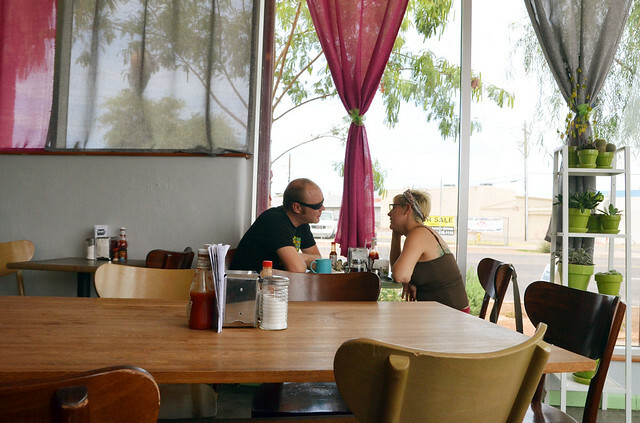 It’s the ideal stop for any road tripping or local vegan crossing through the desert of breakfast-ville. Getting a wad of vegetables balanced between bread—in terms of flavor and stackability—is a challenge many restaurant refuse to acknowledge. 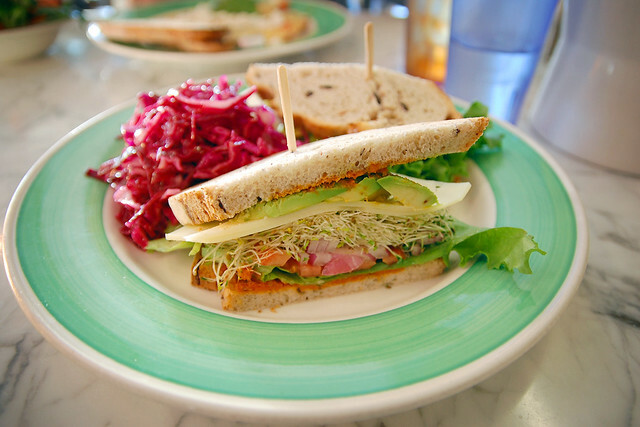 The key is thin slices carefully arranged, plus the use to vegetable cradling alfalfa sprouts, to prevent a vegetable sandwich from collapsing into the proverbial salad. 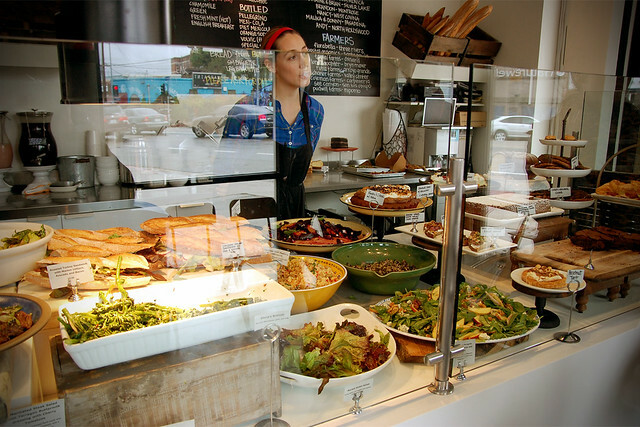 One of the best examples I’ve found is at Los Feliz’s Mustard Seed Café. 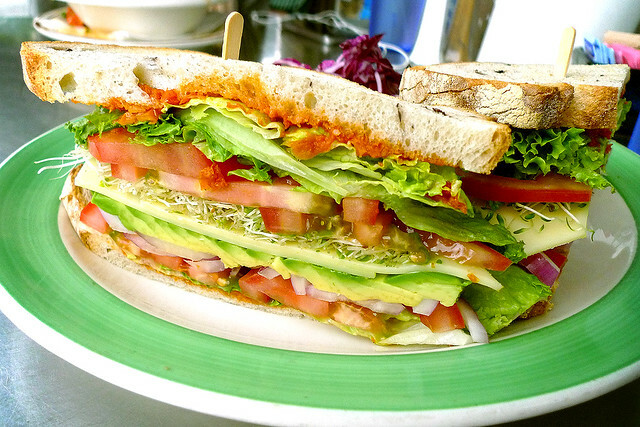 The Veggie Sandwich ($9.95) is served on toasted olive bread with tomato pesto, lettuce, tomatoes, sprouts, swiss cheese, red onions, and avocado. 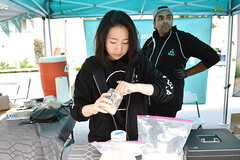 It’s carefully constructed, guaranteeing every veggie in every bite. The tomato pesto—instead of humdrum mayo—adds a tangy undercurrent to the briny bread, plus makes it easy to turn this sandwich vegan (just order sans cheese)! The lightly dressed Red Cabbage Slaw is my side of choice. Crisp cabbage tossed with a barely-there oil and vinegar blend finish off a perfect lunch. 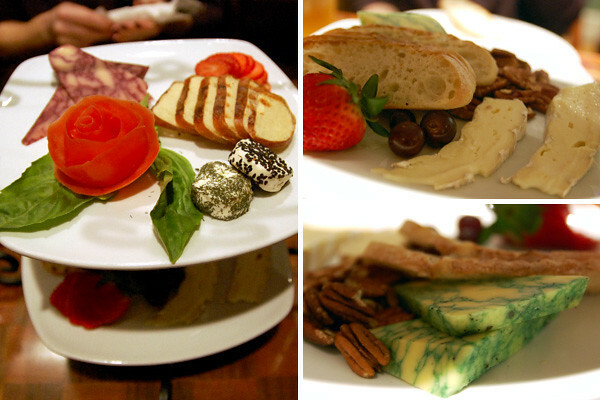 Light on the belly, easy on the wallet… very, very, sort of similar, but not at all, exactly like a salad! A lesser construction, but still a damn good sandwich! I was totally digging those colorful girls in the front! It began years ago. 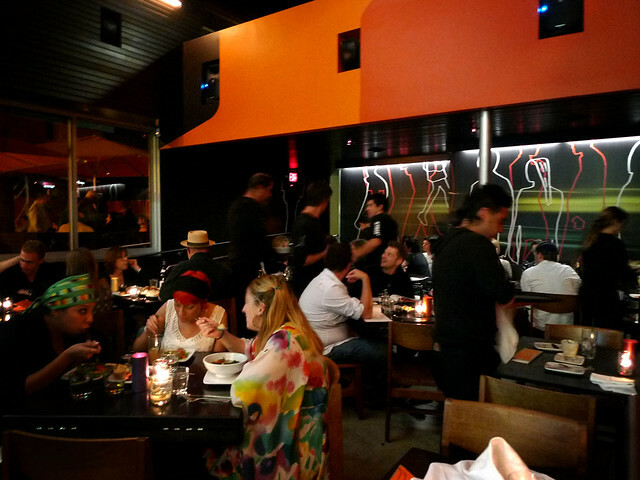 Aloft in New York, I’d fly down to Los Angeles for family and friends… but not for the restaurants. STREET almost changed my mind. I’ve checked in periodically over the years, the menu in a constant flux of evolving blends of modern and traditional street foods. But it has finally come to a beautiful fruition the newest menu revision. Focused on small dishes and with a heavy nod to vegetarians and vegans, STREET is now totally worth a cross country flight… but now in my case, a 20 minute drive.